This third chapter in the Generation Iron series takes you across the world to places such as India, Brazil, Europe, Africa, Canada, and the USA. The cameras capture the passion of bodybuilding throughout different places in the world, and in different cultures. Starring: Kai Greene, Jay Cutler, Dorian Yates. Generation Iron 3 sets out to finally answer the ultimate question: what is the ideal and perfect bodybuilding physique? This third chapter in the Generation Iron series takes you across the world to places such as India, Brazil, Europe, Africa, Canada, and the USA. The cameras capture the passion of bodybuilding throughout different places in the world, and in different cultures. 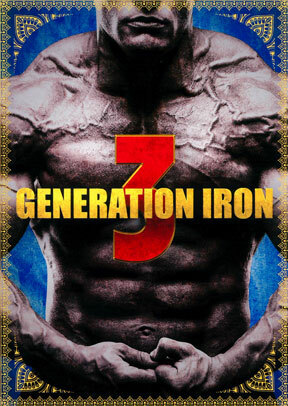 Generation Iron 3 DVD exclusively features deleted scenes, an exclusive Kai Greene interview and much more. The film features today’s top cast such as Kai Greene, Dorian Yates, Chris Bumstead, Felipe Franco and will help answer the ultimate question – what is the ideal and perfect physique worldwide? Starring: Kai Greene, Jay Cutler, Dorian Yates, Rich Gaspari, Regan Grimes, Hadi Choopan, Brandon Hendrickson, Whitney Jones, Ariel Khadr and Varinder Singh Ghuman.